When Alexa offered to let me borrow The Orphan Queen, I was thrilled! I hadn't read anything by Jodi Meadows before, but this book sounded right up my alley. I've become a fantasy convert, which means I want to read anything I can get my hands on from the genre. And if my friends are raving about it? Even better! The Orphan Queen is the story of Wilhelmina, princess displaced from her homeland after the Indigo Kingdom conquered it years ago. She was taken to Skyvale, the Indigo Kingdom's capital, with the other orphaned children of nobility. They've banded together to form the Ospreys - a group with the common goal of returning Wilhelmina to her throne. But in order to do so, Wil and her best friend, Melanie, must go undercover at Skyvale Palace to observe their enemy. At the same time, wraith (the toxic by-product of magic) is pouring across the continent. Magic has been forbidden, but the wraith isn't slowing down. Wilhelmina keeps her own magical abilities hidden, but it might not before the vigilante Black Knife discovers her secrets. The Orphan Queen got off to a bit of a slow start for me. Because you jump right into the story, it took me some time to familiarize myself with the terminology and the world. But the more I read, the more I found myself unable to put the book down. Wilhelmina is a great heroine. I loved her talent for forgery and the fact that she has survived in the shadows for so long. She starts to come into her own as the book progresses, and I found that journey really enjoyable. While reading Part One, I felt the book was a little generic. I liked Meadows writing, the world was interesting, and Wil was compelling... but I didn't feel like anything really set it apart from other YA fantasy series that I've enjoyed. Then, I got to Part Two. And from that point on, I was hooked. The plot captured my attention, the pace picked up and the characters became more developed. I never considered quitting - I was too intrigued for that - but Part Two is when I realized just how much I loved The Orphan Queen. My imagination started to come alive, and I began picturing the things being described in the book. And the romance? Yes, please! I certainly don't think every book needs a romance, but I won't turn one down either. I don't want to say too much about what happens with this aspect of book, so I'll simply note that I loved the way this relationship developed. I loved that it was complicated and presented a huge challenge for both people involved. I can't wait to see its repercussions throughout the series - though I'm a little nervous about what will happen next! I have a feeling it will take a lot of heartache for these characters to work it all out. 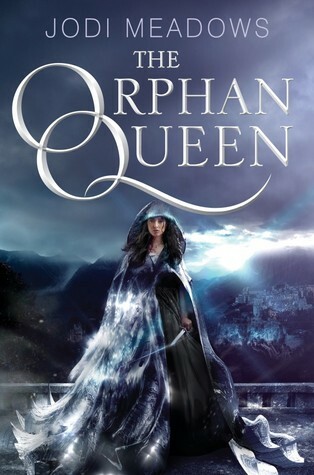 The Orphan Queen is a creative and enjoyable start to a new fantasy series! While I saw a number of the twists/reveals coming, that didn't lessen my enjoyment for the book. There are aspects that feel a bit too familiar - tropes that have appeared in YA fantasy pretty frequently recently, for example - but this is still one of my favorite reads so far this year. It started to really stand out by Part Two, and I have high hopes that it will just continue on that trajectory. I can't wait to see what happens with Wil, and I need the next book. Because yes, this ending is torture. Meadows has me hooked!